Starkitten’s favorite game, since moving to Ohio, is dragon hunting. When the weather is warm enough, we go outside with sticks in hand and bandanas on our head (Sunfilly calls them “pirate hats” and believes this is necessary attire for dragon hunting) and look for dragons. We usually do a few ninja kicks and make some war cries, but sometimes we walk around wielding Lego-made lasers instead of walking sticks. And sometimes we have shields made from toy box lids. Starkitten usually tells us what dragons she sees or hears and whether they are good or bad. For instance, Kitty Dragons are apparently very kind dragons. Sun Dragons are good because they kill the Rain Dragons and Snow Dragons, which want to eat the house. There are also Alien-Zombie Dragons, but Starkitten has apparently only seen them on moonless nights, and by the way she talks about them, I suspect they must be pretty scary. Sometimes, if we are near a body of water, we also go hunting for murlocs. This is especially true if we are fishing. A murloc, in case you did not know, is essentially a fish-like humanoid from World of Warcraft, and not to be confused with H.G. Wells‘ Morlocks (although in a critical analysis of each one’s mythos you could probably draw a few similarities, but that would be its own blog post). Usually players in World of Warcraft kill murlocs to fulfill some kind of quest, and so they are seen as enemies. Startkitten’s murlocs, however, are all good, and vary dramatically in colors, and so the hunting is more of an effort to catch one to play with. I usually try to ask Starkitten to give detailed descriptions of the fantastic creatures she sees. Was it large or small? What color was it? What color were its eyes? Did it have any stripes, spots, or other markings? Did it breathe fire or some other breath weapon? Does it talk? What does it like to eat? And so on, fueling her active imagination. While stargazing tonight, Starkitten told me she saw a Star Dragon in the sky. It was so black that you could only see it for a brief moment against the velvet sky, and only then if you were using the telescope. Its eyes looked like stars. Apparently, this Star Dragon was a baby dragon. And a baby murloc, also nighttime black and with starry eyes, was riding it. Starkitten informed me that they were friendly and that she wanted to catch them to keep as pets. “Yes.” She showed me her Lego-made laser. By the time we came back inside, Starkitten was excitedly telling my husband how she and the baby Star Dragon and the baby murloc vanquished ten of those nasty Alien-Zombie Dragons. I was, apparently, useless (as usual) when it came to dragon hunting. I’d been eaten three times. The inside of the portobello gets a little hollow after it's been grilled, making it great for filling with something flavorful. Speaking of fighting imaginary monsters and making imaginary friends, I recently experienced the wonders of a Vegetarian Steakburger. One of my vegan friends once commented that portobello mushrooms are to vegans and vegetarians what steaks are to carnivores and omnivores. So lately I’ve been eager to try some of this “vegetarian steak.” I knew that people would grill portobello mushrooms for burgers, and so I decided to give that a try. I made up the recipe below, influenced heavily by Louisiana cuisine. The recipe calls for Tony Chachere’s Creole Seasoning, which is a pretty ubiquitous spice blend in the Deep South. You could probably find it easily in a grocery store or online, but if you cannot find it, you can mix something close to the same blend by following the instructions from his cookbook here. Grilling the filling in a frying pan. Grilling the portobello mushroom on a skillet. Heat 2 tablespoons of oil in a frying pan. Add all the onions and saute them until they are starting to get tender. 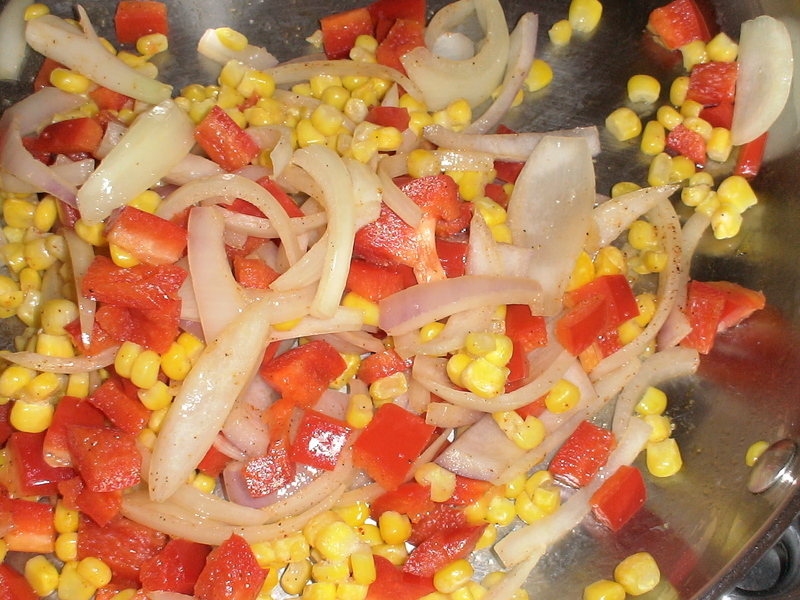 Then add the red bell pepper and continue to saute until all the vegetables are tender. Add the corn to the mixture. Cook until everything is hot. Heat 1 tablespoon of oil on a skillet. Add the portobello mushrooms and a few sprinkles of water. Cover. 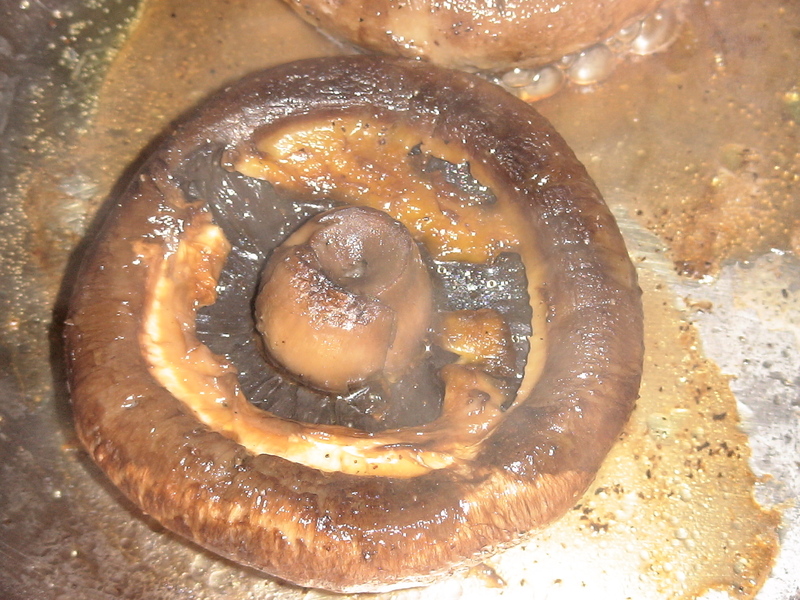 The steam should help soften the mushrooms. Flip the mushrooms over. While the bottoms are grilling, sprinkle salt and pepper to taste on the tops. When the mushrooms are tender, they are done. Remove from heat. 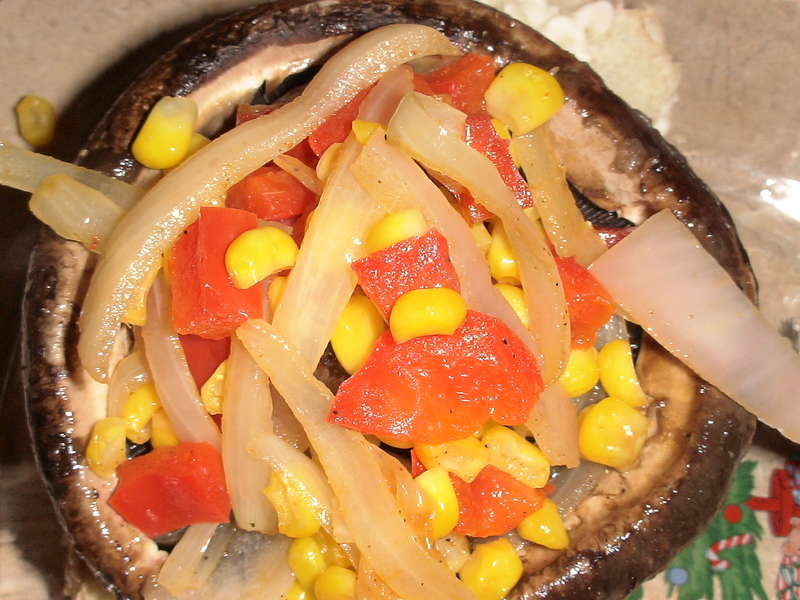 Place mushrooms on a plate, undersides facing up. Spoon some of the filling into the mushrooms, filling the caps. Feel free to mound it up a little. 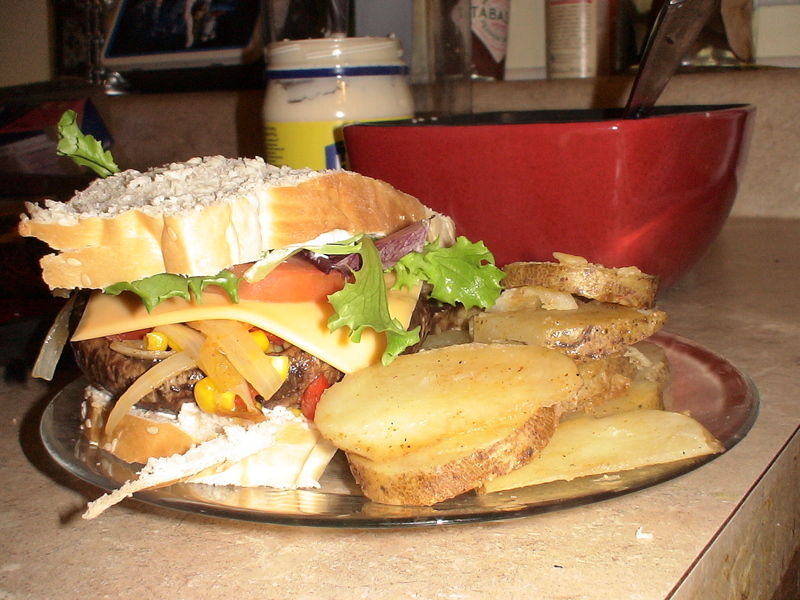 Serve on bread or a hamburger bun, with the same condiments you would use on a burger. If you want to make homemade hamburger buns, you can try this recipe. And now I understand why vegans consider portobello mushrooms “vegetarian steak.” These burgers were absolutely amazing! I fully intend to make this a regular menu item for our household now. The finished product, served with cheese, tomatoes, avocados, and lettuce on sliced homemade bread, with a side of spiced pan-fried potato slices. Since I’ve been grappling with the “winter blues,” on top of the other stressful things in my life that are not made easier by said affliction, I began scouring the internet for ideas to pull myself out of this funk. I stumbled upon this interesting article from DivineCaroline, which offered many good suggestions, including light therapy, exercise, and aromatherapy. I realized that one of the reasons I’d been enjoying cooking beans and tacos is because the smell of these foods is a form of aromatherapy, letting my mind wander off to childhood nostalgia. I also found that brightening up the house has been helping. Yesterday had a particularly sunny afternoon. It was a relief, because it’s been so overcast and gloomy for the past few weeks. I pulled up all the blinds on the west-facing side of the house to let in the light. I can see a pond from these windows, and the way the sunlight reflected off the pond and bounced into the house just made everything seem warm and cheery. I played happy music and danced around with the kids. I let them play with brightly-colored paints and stickers and construction paper and hung their art on the walls to add color to the house. And it seemed like the sun took forever to set, which was a beautiful feeling. It gave me energy I hadn’t felt in a couple months. Suddenly I found myself seriously working on some creative writing–a hobby I had not touched in years, except to flirt with, because law school had literally killed the artist/writer in me (that is, apparently, the sad truth for a lot of lawyers). Being able to write, to create, again was a beautiful feeling. Last night, we had a good half hour of a clear sky, with a very thin slit for a moon, so for the first time since we’d gotten a telescope (my husband received it as a prize from work around the new year), we were able to use it. We zoomed in on the Pleiades and showed them to the girls. The experience of stargazing with the girls, appreciating the awesome bigness of the universe, helped me to remember that my problems are so small and temporal in comparison. After my husband took the kids inside for bed, I remained outside with the telescope, sitting on the frozen grass, listening to honking flocks of geese in their nocturnal southward journey, falling in love all over again with another one of my interests that I’d abandoned over the years. 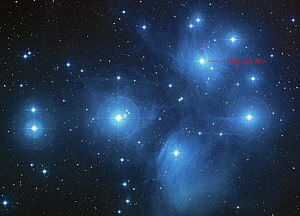 One of the seven Pleiades in Greek mythology, and the brightest of the seven stars in the cluster, is Maia. She is a gentle nurturer and mother of Hermes. In Roman mythology, she became one of the Earth Mother goddesses. In retrospect, it seemed fitting that I spent so much time admiring Maia as both the star and the goddess, with Saraswati‘s day on the horizon. Saraswati, in Hinduism, is the goddess of wisdom, knowledge (both scholarly and spiritual), creativity, and the arts (visual, musical, and literary). She is also the one who gives each person his/her essence of self. She is the wife of Brahma, the Hindu creator god. She is gentle, wise, and unmoved by material riches (depictions of her rarely show her wearing more than a couple gold pendants). White geese and swans are sacred to her, and some Hindus believe that books are one of her embodiments (stepping on or destroying a book is therefore very offensive to Saraswati). Colors associated with her are white, which symbolizes purity and simplicity, and yellow, the color of rebirth of the sun (the days are getting longer again) and the mustard plants that bloom during her festival. Today is Vasant Panchami, the Hindu festival that honors Saraswati. Since yellow is one of her colors, Hindus prepare dishes that are yellow in her honor. They place books at her altar and academic institutions hold services to venerate her. Children fly kites, filling the sky with color, bringing vibrant life to the dead winter skies. Part of the purpose of these celebrations is to surrender oneself to nature, the rebirth of light, and the creativity associated with it. It’s been way too cold here in Ohio to fly kites (although if we were still in Texas, it’s very likely many people would be flying kites today), with the wind chill being in the teens at best. Instead, the kids and I focused on Saraswati as a goddess of knowledge and creativity. We played some more with bright paints and construction paper, I wrote for fun, and then we played learning games. Fortunately, the girls were already familiar with Saraswati, since she is included in The Book of Goddesses by Kris Waldherr, and the girls refer to her, along with Athena, as “school goddesses.” And since Starkitten is already insisting that she is ready to go to school (despite being too young by a couple years), taking time to honor the “school goddess” was something she was more than happy to do. Taking time to honor Saraswati seems to have helped me kick the winter blues. Her holy day and her role as a goddess are both very similar to the Wiccan holiday that happens about this same time of year: Imbolc (Gaelic for “in the womb,” as this is the time of year when ewes are pregnant), which honors Brigid. Brigid is a Celtic goddess of the home and the hearth (and fire in particular), but she is also a goddess of creativity–both in writing and in creating things (particularly smithing)–and healing. It is quite fascinating that, as Diwali and Samhain are close together in time (and of course winter holidays like Christmas, Chanukah, Saturnalia, and Yule share the same general calendar time), so are Vasant Panchami and Imbolc. Sometimes it makes me wonder if our ancestors were on to some Big Idea that has been lost to the ages as we have advanced technologically. We get so lost in social obligations and material things that we have forgotten to pause and lose ourselves to nature every now and then: to the lengthening days, the budding leaves, the infinite vastness of the cosmos, the rhythms and cycles of the world around us… and all that they can teach us and inspire within us. Even though we are sticking to the “mostly vegetarian” diet, my husband originally suggested that we should still eat something meaty and fun for holidays we observe. But because Vasant Panchami is a Hindu holy day, and many Hindus are vegetarian as a matter of faith, I decided to make a vegetarian dinner. I tried my first recipe out of The Vegetarian Family Cookbook by Nava Atlas for this occasion (learning new things for the goddess of knowledge), embellishing it a bit to fit Saraswati’s Day (woohoo for creativity!). The recipe below is my variation to the recipe in the book. Heat the oil in a large skillet or frying pan. Sauté the garlic over medium-low heat until just turning golden. Add the bell pepper, broccoli, and 1/2 cup water. 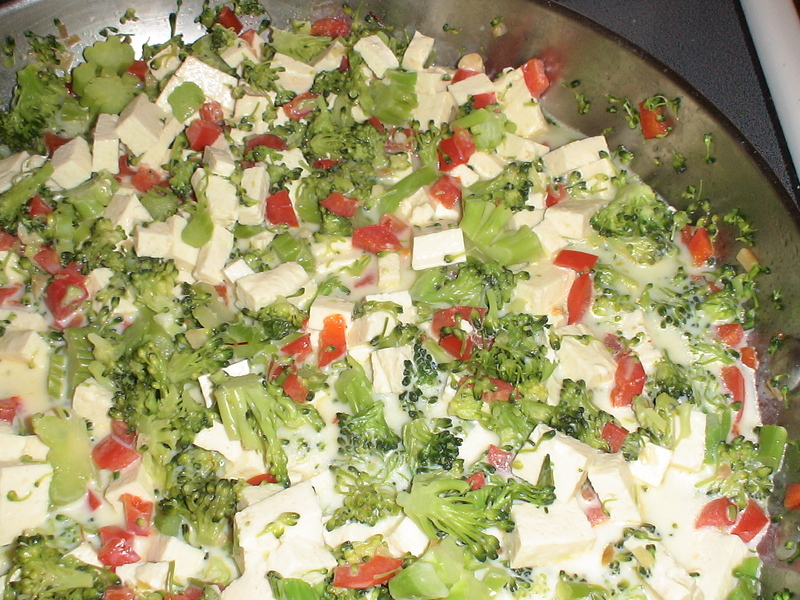 Cover and cook over medium heat, until the broccoli is tender-crisp. Use a little of the milk to dissolve the flour and mustard until it is smooth and flowing. Stir into the skillet with the remaining milk. Add the tofu and saffron. Cook for a few more minutes. Stir in the cheese and simmer gently until everything is well heated through. Serve immediately. 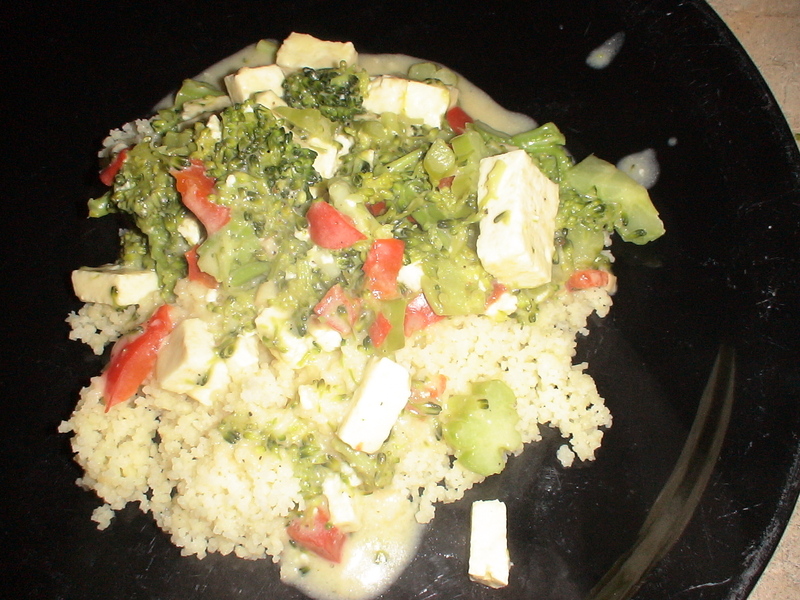 It goes well served over rice or couscous and with a side of corn or sweet potatoes. Even for a former carnivore, this meal was fantastic. There were no leftovers. For dessert, and so that we’d have an Indian dish to eat for Vasant Panchami, I scoured the internet for something appropriate and easy to prepare. 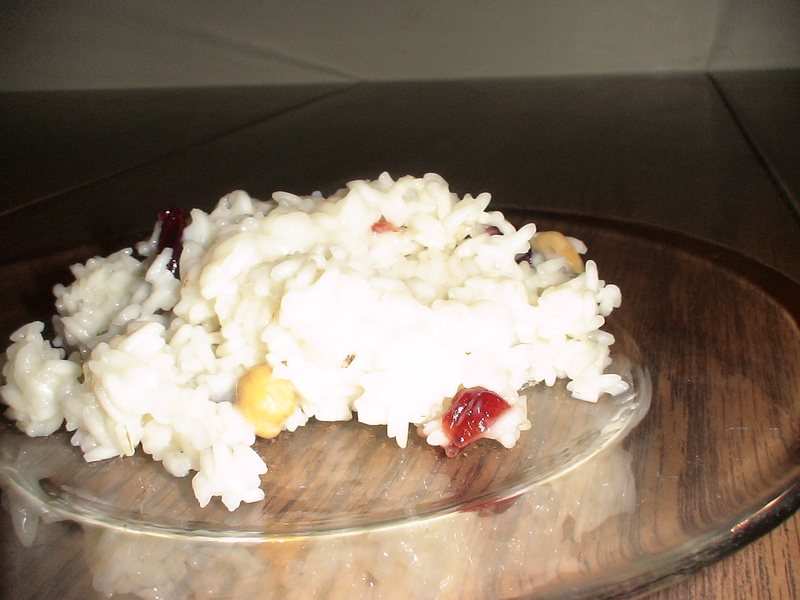 I found this recipe for Punjabi sweet rice on Food.com and adapted it. You’re supposed to use basmati rice for this recipe, but we recently used up our last big bag of it that we brought from Dallas (where there is a huge Indian population and you can get basmati rice fairly inexpensively if you know where to look), and so I used standard American rice (I don’t know what kind it is, exactly, but it’s the common kind you can find at most grocery stores). 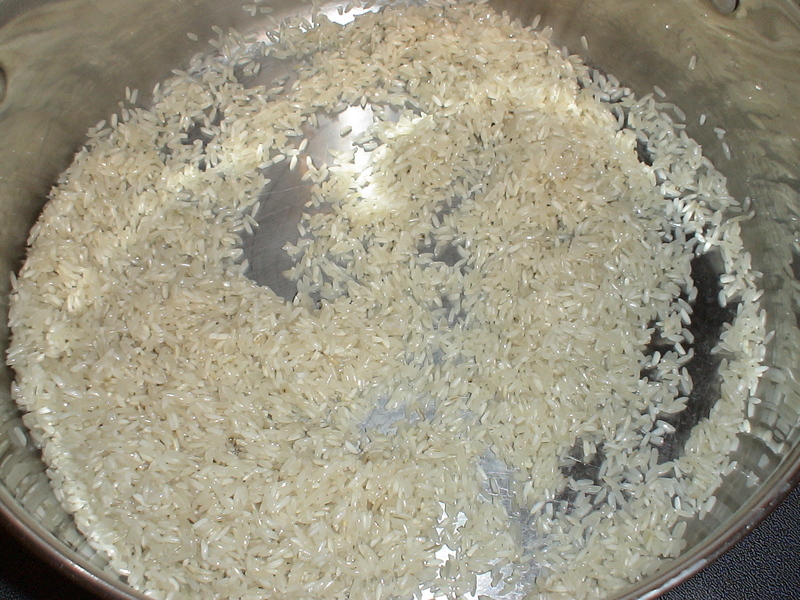 If you are cooking with something that is not basmati rice, you may need to add more water to the recipe and/or cook the rice longer. I followed the instructions below, and my rice came out a little al dente. That was fine for my family, but since others may want softer rice, I wanted to point this out beforehand. 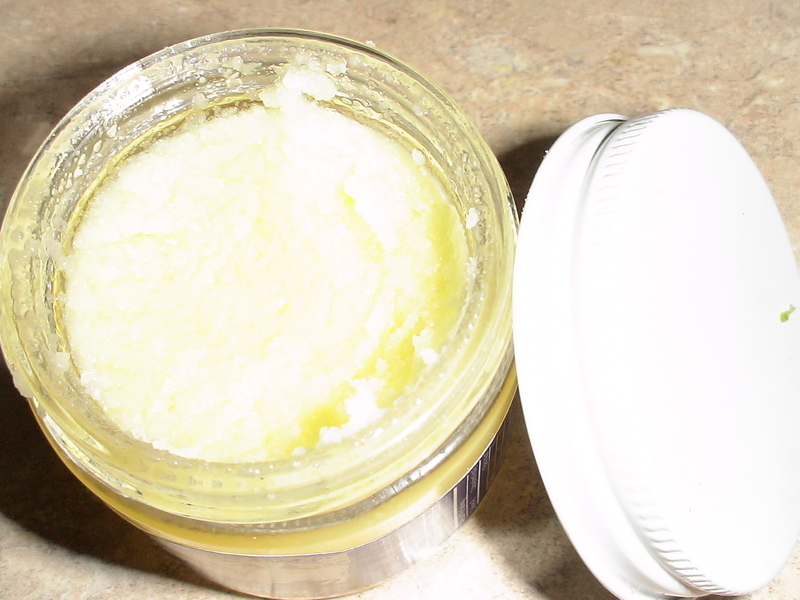 The recipe calls for ghee, which is a sort of butter extract. You may have to look in a specialty grocery store. If you can’t find any ghee, you can get by with 2 tablespoons of butter. You can also check here to see a list of other products similar to ghee, in case any of them are available in your area. For instance, Kenyans make something called mwaita, which is made pretty much the same way as ghee. Warm up the milk and pour in a small bowl. Add the saffron. Set aside. Melt the ghee in a medium saucepan. Add the rice and fry it. Add the milk-saffron mixture, sugar, and enough water to cover the rice completely (I’d recommend you get at least 1/4 inch of liquid above the rice). Cover and cook on low heat for 15-20 minutes. When all the water is absorbed, remove from heat. Stir in the nuts and raisins. Serve hot. Garnish with more nuts and raisins. This was a fantastic dessert. It was a little on the sweet side, but my husband, who generally dislikes sweets, really loved the sweet rice (he loved it so much, in fact, that I had to make a second batch to put in the fridge for him to take with him to work for brunch tomorrow). I’ve been in a dark place the past couple of weeks. It’s been the kind of stressful that killed every ounce of creativity in me. At first, I didn’t want to even bring up to the blogging world that I’ve been stressed out, since it’s a depressing topic, but parenting isn’t always pretty (and neither is life), and since I’d said I was blogging about the good, the bad, and the ugly of parenting (yep, it can feel kind of like a Western film), I might as well be fair about it. It’s difficult being a good parent when you’re preoccupied with something that’s incredibly stressful. It’s even more difficult when you’re a stay-at-home parent, and so getting away from work (i.e. taking care of the children) is next to impossible. A snow-covered world as seen from my back window. I really miss that about working. I could leave work and come home to the kids, or leave the kids by going to work. If one of those was a stressful environment, the other offered respite. And if both were driving me crazy, I was at least making money and so could afford to occasionally take off for a weekend with friends. So all I could do was try to keep distracted: playing with the kids, reading something lighthearted, or watching comedies with my family. Anything that didn’t give me time to myself to think, lest my stress affect me physically. Of course, it didn’t help that this is the dark time of the year, and apparently I am sensitive to the day length. At one point, I began to feel hopeless, and so I took time to read excerpts of The Sickness Unto Death by Søren Kierkegaard. While he is the father of existentialist philosophy (questioning all religion and morality until you come to the conclusion that life is absolutely ridiculous), he basically says, “What the hell. Take a leap of faith and believe in God.” (Or, in my case, gods.) It helped, if for no other reason than reminded me that nothing (not even horrible situations) lasts forever. It gave me hope. One night, Sunfilly kept having nightmares, and so I had Starkitten sleep with my husband on our bed and I joined Sunfilly on Starkitten’s twin bed. Once I finally calmed her down and snuggled her back to sleep, I lay there, admiring how peaceful and angelic she looked. Her sweet little face–even the way her lips move like she’s sucking an imaginary thumb–reminded me to be strong for her sister and her. It also helped that, during these past couple weeks, we’d been surprised by small gifts from various friends. Each one made my eyes well up from gratitude. Each box was like a small piece of sunlight breaking through a cavern. It was a cosmic reminder: We are not alone in this dark path. And so I found strength. A pair of beautiful swans in the local pond. A winter storm blew through here last week, bringing biting winds and 5 inches of snowfall. 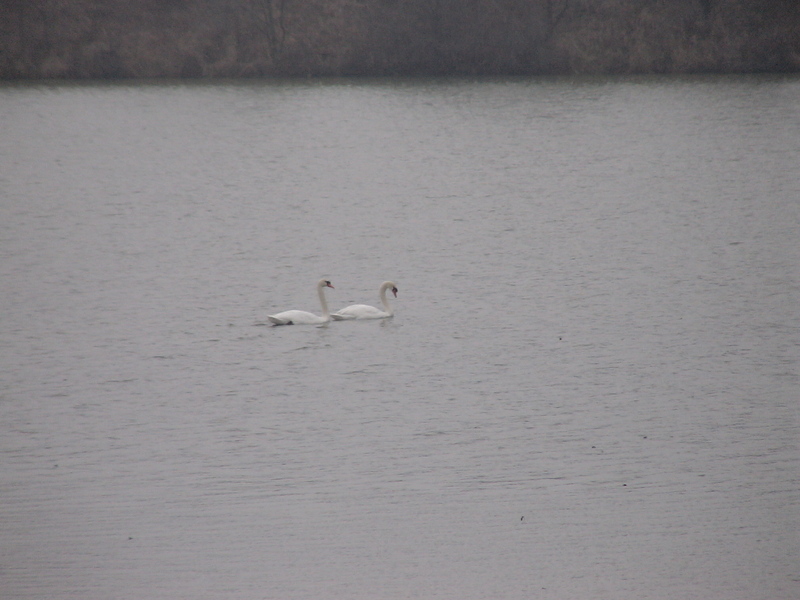 Right before the storm, I spotted a pair of swans in a nearby pond. I ran out to take some pictures of them, and then ran back inside just in time to gaze at big, fluffy snowflakes falling from the sky. At one point, we had a couple days that were so cold we were excited if the highs hit the twenties. The wind chill was in the negative teens. I threw on my house slippers and a winter coat and ran out to check the mail (the mailbox is about a football field’s distance away from the house). 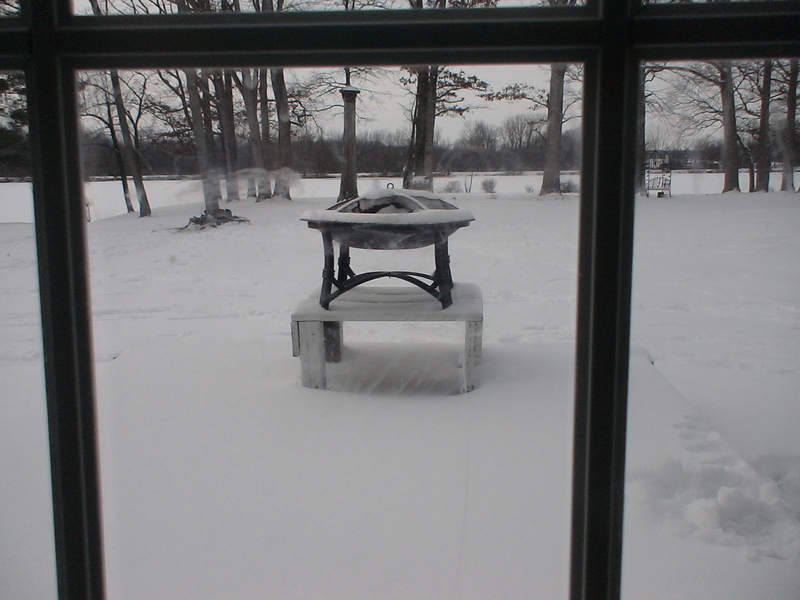 By the time I darted back inside the house, my nose, fingers, and feet were so cold they burned. And so I learned the meaning of the phrase “biting cold.” And also why people wear scarves. 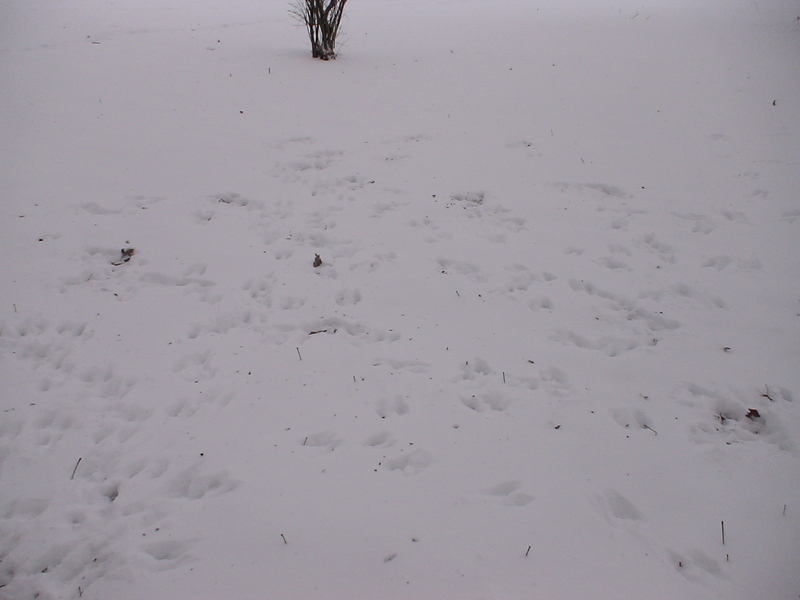 A bunch of rabbit tracks. After the storm passed, I made sure to take a few moments to appreciate the beauty of winter (instead of cursing it). The local pond had frozen to a thickness that supported the weight of an average sized adult. A couple people were trying to ice fish. They did not have any luck, and joked that it was because we brought Texas “winter weather” to Ohio (in other words, it’s been too warm for winter fishing and too cold for normal fishing). The pond was also covered with a thick layer of snow, which was a surreal sight. 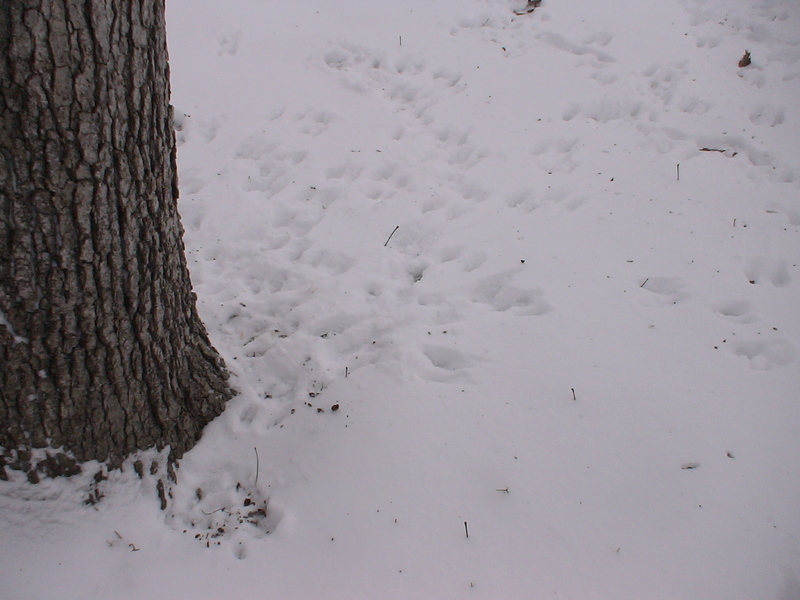 Rabbit tracks around the trunk of an oak tree. There are bits of chewed-up acorn. We took a stroll in a nearby forest and spotted rabbit tracks in the snow. It looked like they were hopping from tree to tree, either looking for a burrow in which to hide or acorns to dig up (we did spot a few chewed-up acorns on top of the snow). 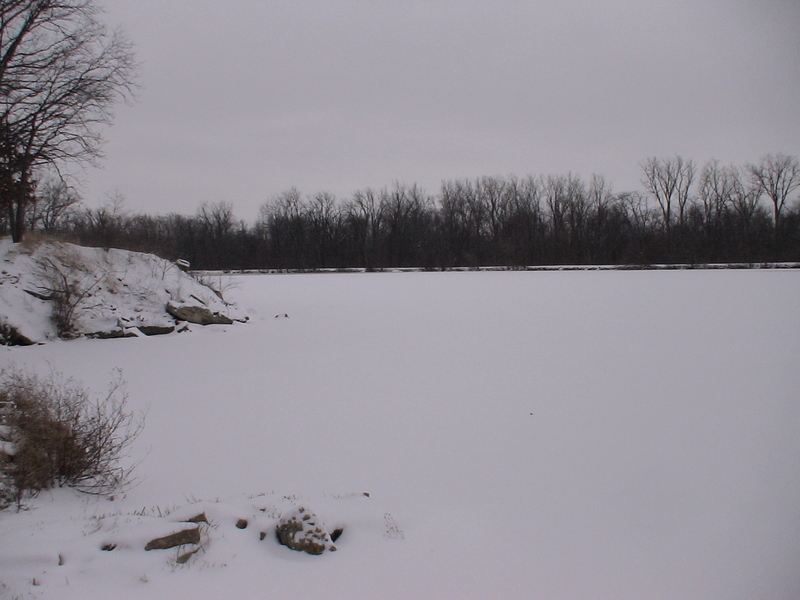 Here is the pond when it was frozen and covered with snow. 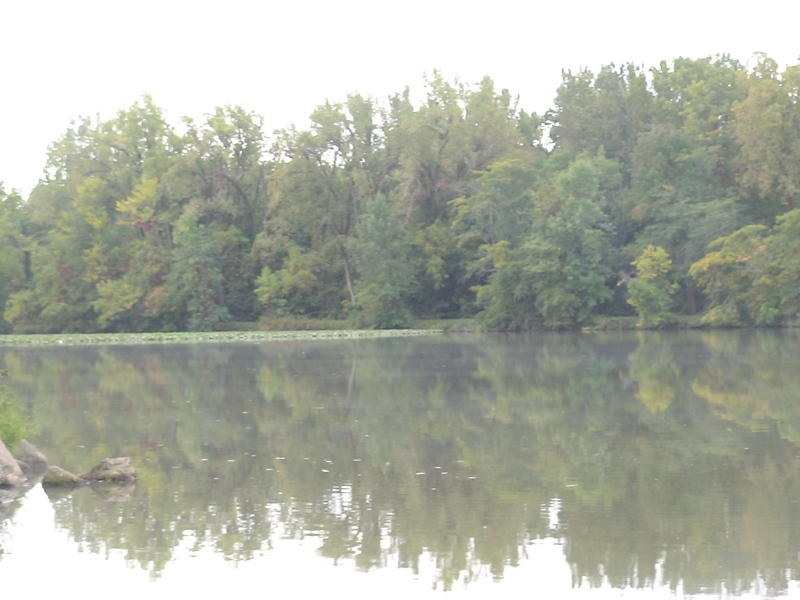 For a point of reference, below is the same view of the pond during late summer (I took this photo in mid-September, when we first moved to Ohio). I love cooking with mixed beans. 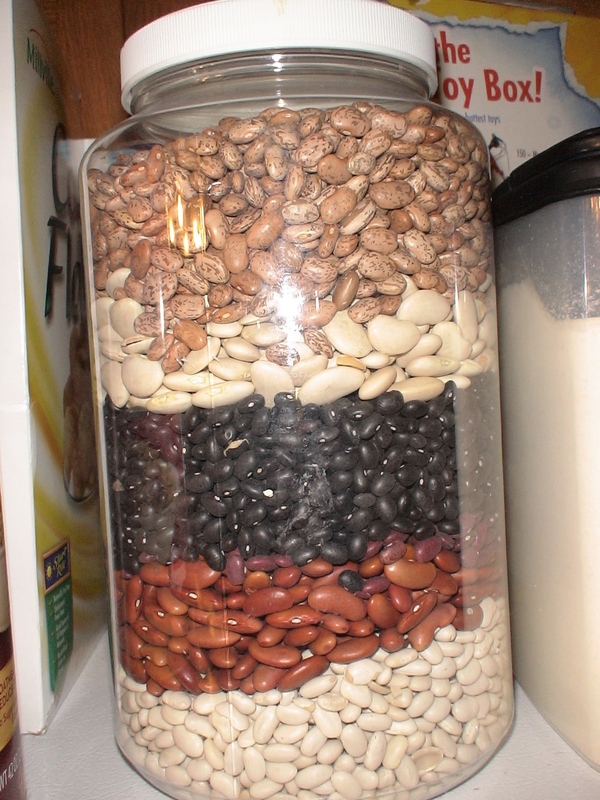 After I open the bags of various beans to make a batch, I pour the remaining beans into a large jar to make decorative layers like this. I'll mix them together when it's time to cook them. When a person is depressed, comfort food does a lot for reviving one’s spirits. Because I grew up with a lot of Mexican food (my father is Mexican and my mother learned to cook for my father), beans are actually one of my comfort foods (which is ironic, considering that beans give me uncomfortable gas). And since we are eating a mostly vegetarian diet, beans became an easy main dish to prepare. 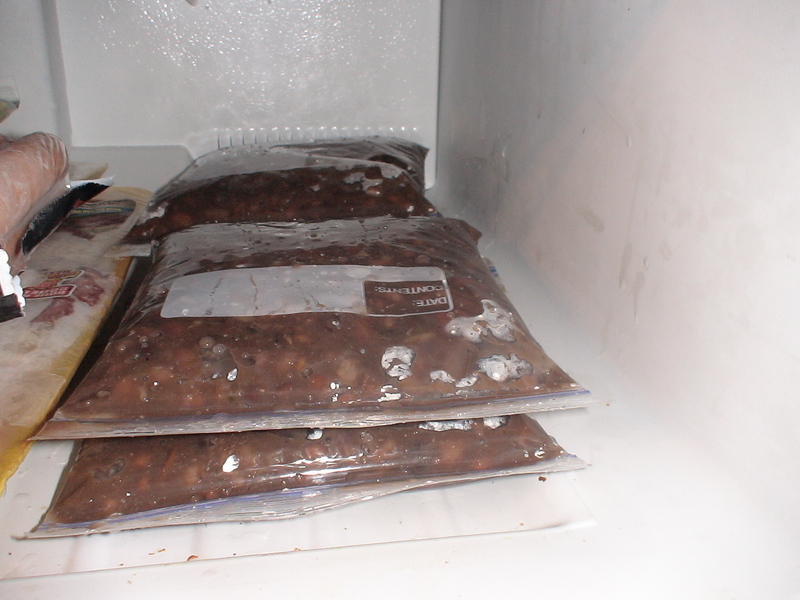 Beans store easily in the freezer. I love cooking beans, because you can toss them in a large pot and cook them all day. Whatever you don’t eat immediately you can divide into 3- or 4-cup portions and freeze neatly to save for later. They are easy to thaw and can be used in a wide range of dishes (or as a side by themselves). They are also incredibly inexpensive (cooking your own beans is four times cheaper than buying them canned). I tended to make bean tacos. 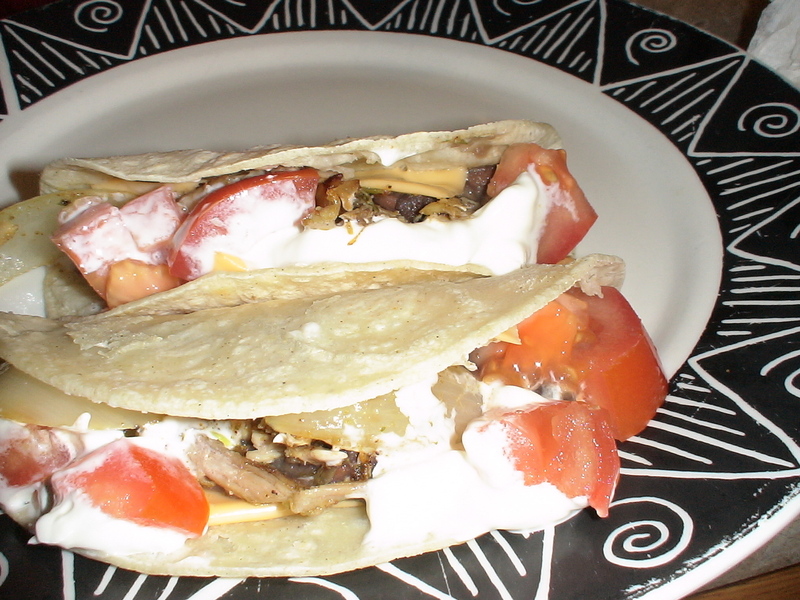 I also made tacos with some leftover Christmas turkey that I’d frozen. 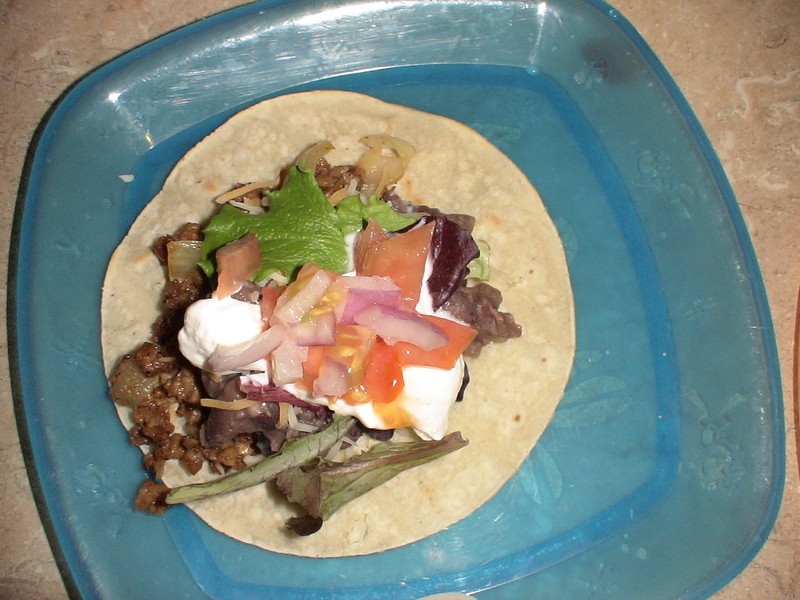 And, for variety, I tried using some Yves Meatless Ground in lieu of ground beef, and it made for some fantastic tacos (it’s also half the price of a pound of ground beef here in Ohio and much lower in its fat count). I’ve been using the same taco seasoning I gleaned from my Buelita (a diminutive form of the Spanish word“abuela,” for my paternal grandmother). Learning recipes from her was an experience unto itself. She did not use measuring tools. Increments were in palmfuls, or enough to coat two fingers or the food in the frying pan, or a just couple shakes of the bottle. She just knew how much to put into a dish and relied on smell to get it right. And I learned how to cook Mexican food from her. NOTE: I should point out that “Mexican cuisine” is a broad term. It’s like saying “Indian cuisine” or “Chinese cuisine” or even “American cuisine.” Mexican food varies between regions and ethnic groups. Parts of my father’s family came from Veracruz and other parts had lived in Texas from the time when it was still a Spanish territory, and his side of the family is more Spaniard in ethnicity (we come from a line of disinherited nobility) than it is Mayan or any other indigenous tribe (although some indigenous Mexicans are in our family tree all the same). So I have no clue how to correctly characterize the kind of Mexican food I grew up with (or if it’s just “Tex-Mex”), except to use “Mexican food” in the generic sense. It wasn’t until a couple years ago that I bothered trying to measure out the spices that I used to make taco seasoning to help a friend learn to make something more authentic. I’ve used this blend on a variety of taco “meats” (as mentioned above), and my family loves it. You can always tweak the proportions, depending upon what flavors you want to enhance or subdue. 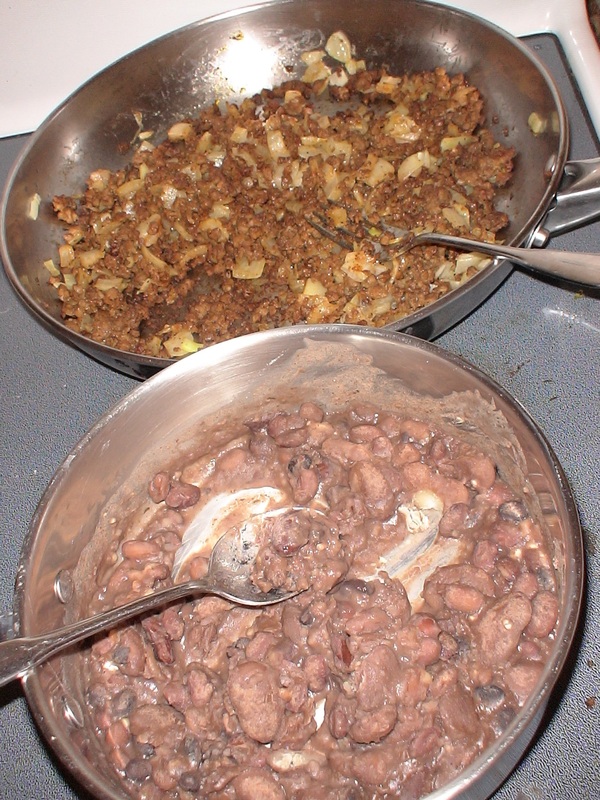 Yves Meatless Ground (above) and mixed beans (below) being prepared for tacos. Mix the spices together and sprinkle over chicken, beef, beans, or whatever you’re using for taco filling. It tastes best if you sautee some onions first and add them to the filling, along with some chopped fresh cilantro. One of the presents I received was The Vegetarian Family Cookbook by Nava Atlas, which is apparently written for people who are transitioning into vegetarianism. I’ll be trying out a few recipes, so I intend to post a review of that book shortly. You can use the same blend for taco filling to make chalupas. For Drinks and Tips A pair a musicians sharing their exciting road trip experiences. The Mary Sue Feminism and nerdiness rolled into one awesome blog. The Pagan Mom Blog A parenting blog for neopagan families. Bon Appetit Written by an awesome mom and foodie in India. Kathryn Aileen's Cooking Adventure A working mom shares her culinary inventions. The Year of Numbers A busy mom sharing her experiences and recipes. Weekday Vegetarian Easy vegan and vegetarian recipes and helpful meal planning. Breathelighter An uplifting guide to personal well-being. A fun read! WebMD A neurotic mom’s little helper. Coupon Pro Blog Useful for clipping coupons. Deal Detecting Diva A useful blog for finding bargains. Good Stewardess A guide to bargain-hunting reasonably. Includes national and regional deals. Saving Myself Silly A guide to frugal living and bargain-hunting. Texas-based.